← Peppermill- 15th Nov! Sign up now!! Train to Meilen from Zürich HB – S7, S6 and S16 trains from Zürich HB or S7 from Zürich Hardbrücke. Trains run every half hour and take 25 – 30 mins. Public transport timetables are available here. 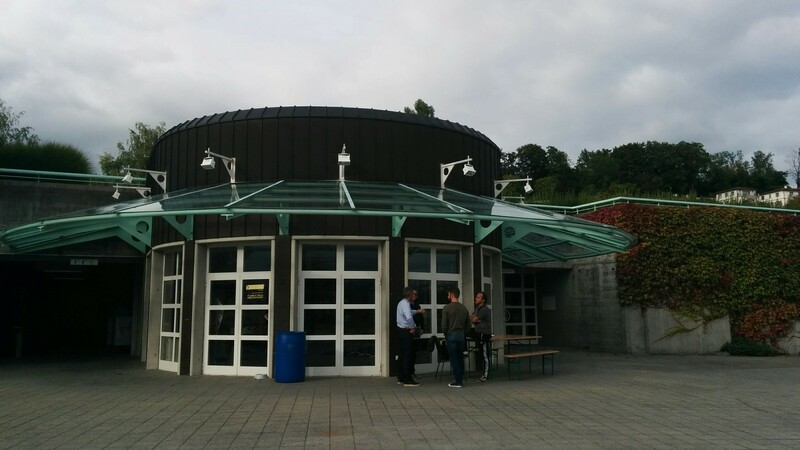 Venue is 6 mins walk uphill from Bahnhof Meilen or take bus 922 direction Meilen, Hohenegg to stop Meilen, Hallenbad. Parking Available at Parkplatz Ormis or on Ormisstrasse. Parking is also available at the Hallenbad but might be limited for space. What is there? The Sporthall is a large facility and has a café as well as everything we need in the way of changing rooms, etc. There is also a viewing gallery, if anyone would like to come along and watch! Food / Drink: Zurich Netball will run a stall on Saturday selling sandwiches, cakes, cold drinks and coffees, as well as Swiss Netball merchandise. Please bring coins and smallish notes to pay for these items. 12 teams will compete in the tournament. We have three courts available. All matches are 2 x 12 mins + 1 min half-time break. Start: 9.00am Finish: ca. 5pm. Every team has an allocated slot for umpiring / scoring duties – please ensure you have allocated these responsibilities in advance to reduce confusion on the day. We have booked an apéro rather than booking a table for dinner, so people can pop in or stay longer as they feel like. The apéro will be hosted by Zürich Netball Club, and will include light bites and drinks. Directions: The venue is a 5 minute walk from Zürich HB from the Sihlpost / Europallee exit past platform 3. Anyone who would like to book a table for a later dinner at Little Italy is welcome to do so on an individual basis – Kennedy’s Irish Pub and Loft 5 round the corner also offer food quite late on Saturdays but tend to get busy! There are very few hotels immediately near the venue. However, Meilen is easily reached from central Zürich by train or by road. The most convenient railway stations for the S-bahn lines that go to Meilen are Stadelhofen, Hardbrücke and Zürich HB. Swiss Netball’s Cadre d’Espoir will be training at Meilen the day after the Peppermill – the coaching will be lead by none other than Tamsin Greenway – formerly of England and currently Surrey Storm Head Player Coach. All Zurich members are welcome to come and spectate, as it will be a great opportunity to see the high level coaching on offer as a result of Swiss Netball’s development partnership with Netball England, and to see the best of Switzerland’s young netballers in action. Time: 10am – 4pm in the Meilen hall. Please note, that NO catering facilities will be in place for this, apart from coffees. Participants and spectators should make sure to bring lunch and snacks! Iwill right awsay seize your rss feed as I can’t find your email subscription hyperlink or newsletter service. Do you have any? Kindly lett mme realize so that I may subscribe. We do not have an email subscription or newsletter service. But please check out our facebook page for regular updates on training and events!